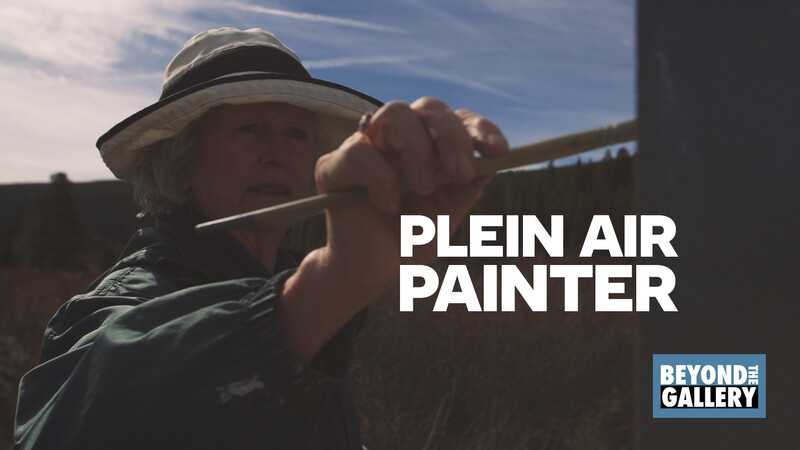 Today I’m thrilled to introduce you to Amy Evans, a plein air painter in Breckenridge Arts District. Painting is not easy. As an artist, Amy thinks the biggest fear is that someone doesn’t understand what her paintings are about. They think they’re just pretty pictures, and they don’t really see that there’s more to this – it’s the whole experience that she is painting, and she wants to bring that feeling into someone else’s life. Amy’s love of painting began as a child growing up in Shreveport, Louisiana. Teachers and her parents encouraged her talent. At the age of eight she took private lessons from the late Elizabeth Friedburg and continued to study art throughout her high school years. She was always painting and drawing and was involved with many art projects in school. Season Four of Beyond the Gallery is sponsored by Colorado Creative Industries. A division of the Colorado Office of Economic Development and International Trade, Colorado Creative Industries believes in the power of creativity to inspire human connections, create social change and support economic vibrancy throughout Colorado. They believe in the practice of creation, the artists and entrepreneurs who contribute to our rich culture and the benefits of our creative economy. Colorado Creative Industries supports and encourages the innovators, creators, change-makers and dreamers who improve our quality of life and make Colorado creative. They focus on strengthening the vitality of visual, performing and literary arts through promotion, resources and funding opportunities. They believe in bold innovation and the invaluable contributions the arts bring to this beautiful state.